The WRIA 8 Plan acknowledges that its annual funding goal for implementation is ambitious, and recognizes the difficulties of maintaining long-term support for salmon recovery funding. Over the past 10 years, funding has fluctuated from one budget cycle to the next. While funding has fallen short overall, some promising trends have developed in the last few years. Grants are a key funding source for habitat protection and restoration projects in WRIA 8. Since the Chinook listing in 1999, the Washington State Salmon Recovery Funding Board (SRFB) has provided crucial funds for project implementation. This funding source includes federal dollars from the Pacific Coastal Salmon Recovery Fund (PCSRF) along with state matching funds. While SRFB funds have been available each year, the total is far less than the WRIA 8 Plan anticipated, due largely to reduced federal and state funding support. 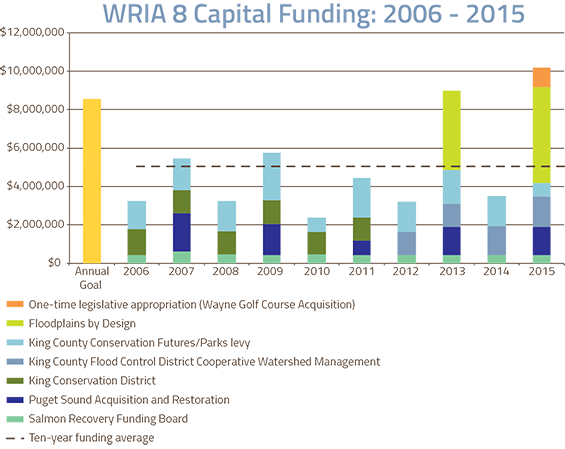 Since 2006, WRIA 8 has received over $4.2 million in SRFB funds to allocate to priority projects. "Strong investments in a sustainable salmon population are critically important to the economic, cultural and recreational identity of Washington State, and they're also an important part of our federal obligation to meet tribal treaty protected fishing rights." The Puget Sound Acquisition and Restoration (PSAR) fund is another essential source of funding for salmon recovery in Puget Sound watersheds. Consistent with their focus on restoring the health of the Sound, the state legislature has supported PSAR in each biennial budget since 2007—a much-needed funding source for salmon recovery. However, the amount of funding for PSAR has varied dramatically. To date, WRIA 8 has received over $7 million in PSAR funding for priority projects. Both SRFB and PSAR are vital sources of funds to implement priority recovery actions, but neither is guaranteed. Support at the federal level for PCSRF and at the state level for salmon recovery capital funding and PSAR is essential to salmon recovery in the years ahead. Grant funds from local sources are equally important to funding WRIA 8 implementation and can help leverage federal and state grants. From the late 1990s until 2011, the King Conservation District (KCD) provided a substantial local investment in salmon recovery—nearly double the amount anticipated by the WRIA 8 Plan. Like SRFB and PSAR funding, KCD dollars were allocated to WRIA 8 and awarded through a competitive grant process involving local technical review and WRIA 8 Salmon Recovery Council approval. Since 2012, the King County Flood Control District has provided this local funding through its Cooperative Watershed Management (CWM) grant program. Notably, the Flood Control District instituted annual adjustments to keep pace with inflation beginning in 2014, significantly boosting local grant funds. In addition to protection and restoration, the CWM program funds outreach and education as well as critical monitoring needs. In addition to the grant programs for which WRIA 8 is directly involved in review and approval, other funds are available for salmon habitat restoration and protection. Most importantly, local jurisdictions contribute significant amounts from utility and surface water management fees and use these funds to leverage grants that advance recovery priorities. Other important local funding sources include the King County Conservation Futures and Parks Levy grant programs. State and federal grants that can help advance recovery goals include the Estuary and Salmon Restoration Program, Aquatic Lands Enhancement Account, Washington Wildlife and Recreation Program, and National Estuary Program. In the last two state funding cycles, the legislature set aside significant amounts for the Coordinated Investment in Puget Sound Floodplains, now called Floodplains by Design. The program awarded $4.1 million in 2013-15 and $5 million in 2015-17 for priority floodplain acquisition and restoration on the Cedar River. Salmon recovery funding and, as a consequence, implementation of the WRIA 8 Plan, have not consistently kept pace with the ambitious goals set 10 years ago. The plan's funding strategy offered an optimistic view of the future that, until recently, was largely unrealized. Moreover, WRIA 8 partners have not had sufficient staff to develop restoration concepts into viable projects to implement and manage them. Additionally, local priorities may not always favor voluntary restoration activities over other capital projects or mitigation needs, especially when budgets are tight. In the 2013 and 2015 state legislative funding cycles—both challenging budget years—new funding emerged that helped us achieve our watershed restoration and protection funding goals for the first time. While not focused explicitly on salmon recovery, the new Floodplains by Design program provided a significant injection of funding that supports our efforts, specifically those projects intended to restore floodplain processes. Changes are also underway that will guide the allocation of the Environmental Protection Agency's National Estuary Program funding, which may offer opportunities to further advance our work. We will continue to rely on state and federal lawmakers to provide critical resources and on local leaders to champion our restoration and protection projects. The pace of habitat restoration and protection will continue to be subject to resource availability, and as project complexity increases, funding challenges may become more apparent. Nevertheless, a solid foundation is in place to enable us to expand on our progress so far.